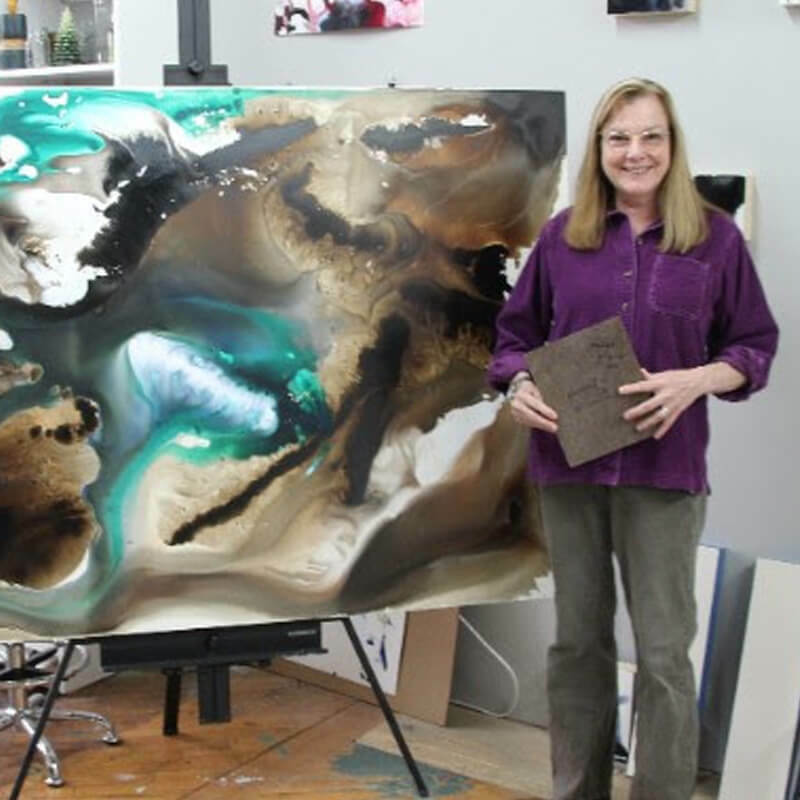 Jeannie Motherwell is an artist whose career has seen a solid, multi-layered path within the art field, in spite of the fact that she spent years hiding her true identity. Jeannie studied painting at Bard College, then at the Art Students League in New York. Next, she pursued arts education, followed by a rich career at Boston University for the graduate program in Arts Administration. She felt fortunate to be surrounded by instructors who were working artists themselves, and by the daily inspiration she gleaned from advising budding art administrators. But every evening, like so many artists. Jeannie would escape her day job to the studio to paint. Recently, Jeannie retired from her full-time role at BU. Before that, her gallery representation of ten years ended when the gallery closed, leaving her at a crossroads. Though she was reluctant about the time and financial investment of The Working Artist course, she was motivated to dive in. “I wanted to learn the most productive way to utilize my newfound time as an artist efficiently and I wanted to find new gallery representation,” she stated. Jeannie’s previous experience in the art world provided a sturdy foundation from which to leap. It wasn’t until after she finished The Working Artist and decided to invest in a Personal Strategy session with Crista that things came full circle. It was during their private session together that Crista realized Jeannie was none other than the daughter of iconic mid-century painter Robert Motherwell and that she’d first learned how to paint from her father and her stepmother, the illustrious Helen Frankenthaler. Crista was astounded that Jeannie Motherwell had chosen to bury this fascinating piece of personal history—or barely mention it— throughout most of her career. “Crista helped me shift my perception by explaining that the truth was an asset; that it’s part of my history, part of who I am and part of what I do today.” Jeannie explained. In the year since completing The Working Artist class, Jeannie Motherwell has signed with two galleries on the east coast with solo shows scheduled at both. She’s also working with an interior designer who expands her audience beyond typical gallery reach and clientele. My daily routine starts with the tasks I can’t attain at the studio. I go to the gym, answer myriad emails, pay bills, do admin work, work on grant applications and make a to-do list of things I need to tend to that day. I try to get to my studio by early afternoon so I can work several hours uninterrupted before heading home for a late dinner. In the event there’s a studio visit from one of my dealers, or a prospective buyer, or even a trip to a gallery or museum, I may arrive earlier or later in the day, but I prefer to stick to a routine so I don’t get side-tracked. My studio is located in a former print factory. There are 100+ artists in the building, which is open ‪24/7. I’ve found there are two general ‘shifts’ when people are there. There are the ‘day people’ and the ‘after work’ people, who generally ‪begin coming in around 7pm. I fall in-between since I arrive around 2 and don’t leave until after 7. On the rare occasion that I’m there in the later evening, I notice the focus is primarily on making art. There is little socializing, and I get a strong sense of being part of a community of people who are hyper-focused on just making art. They’ve likely done all their socializing during their workday and are longing for the solitude of their sacred space found in their studios. For me to be most productive, I need a routine. It may seem counterintuitive for a creative person, but I prefer to accomplish the things I can control, so I can let loose and be totally free when in my studio.